Grazed from GigaOM. Author: Liz Gannes. The online personal-finance assistant Mint often mines user data for trends and interesting charts to feature on its popular corporate blog. Now the Intuit-owned company is preparing to release the data it’s collected on behalf of its 3 million users. The new Mint Data product is currently publicly available as a soft launch, and should be announced to the public in the next few weeks. Instead of simply allowing logged-in members to look at their personal finances, now any visitor can access aggregate spending data for hundreds of U.S. cities. Mint’s data can be sorted to find things like the average tab at a certain restaurant, or the actual deals other people are getting for their memberships at a certain local gym. 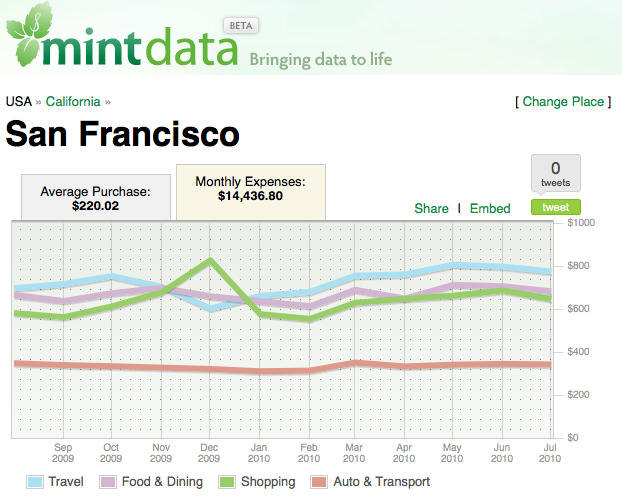 Users can also look at pretty charts that show the average monthly spending by Mint users in a city. I talked with some folks from Mint about the new feature at an Intuit product showcase last night, and they assured me that Mint Data is anonymized because it only features venues where at least 50 Mint users have spent money. 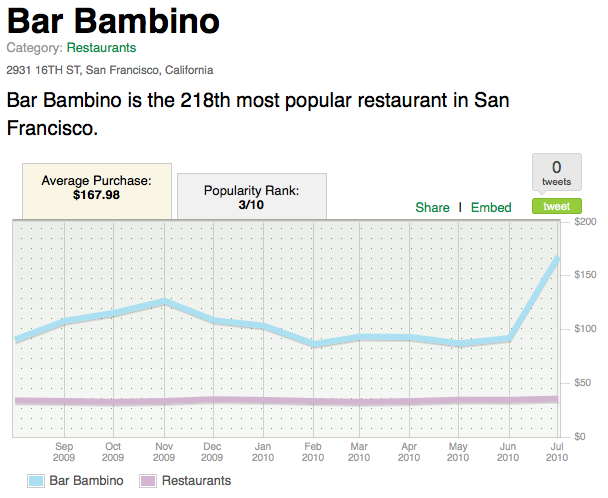 In San Francisco, where I live, the most popular Food & Dining establishment is Starbucks, and the one with the most expensive average purchase is the wine bar Bar Bambino, where Mint users spend an average of $167.97. If you want more publicly accessible aggregate spending data, you should also check out Bundle, which probably offers a more representative data set given it pulls spending information from Citigroup (c c) (one of its investors).